Wanted to give author dreed a shout out for a truly awesome tutorial on using rsyslog to format and ship logs to a remote logstash server listening on a tcp endpoint. Followed this last night and was able to get our logs from haproxy over to logstash and into elasticsearch all running in Google’s kubernetes container engine. Nice work, dreed. I would have commented on the site but for disqus and having to sign in. So it’s late, and I’ve been messing with feed parsing again. I have this project that I’ve been assembling off and on for awhile, and it involves ingesting and analyzing RSS and Atom news feeds. I’m using python 2.5.9 and lxml to parse the content from these feeds. The lxml package is a powerful and very fast xml/html parser, but it has its quirks. A little trick we came up with for a recent project. When developing back-end software in python or any other language there is often a need to load different values for configuration settings based on environment. A typical case is a database connection address and port, for example, that would be different when working locally vs. test vs. production. There are lots of ways to do this, but this one worked well for us. The technique relies on setting an environment variable with the name of the environment, and then using that name to load a default settings file and an environment-specific settings file and merge them both into the global namespace. I’ve said for years that .NET should be open sourced and cross-platform, and that development is finally taking place. 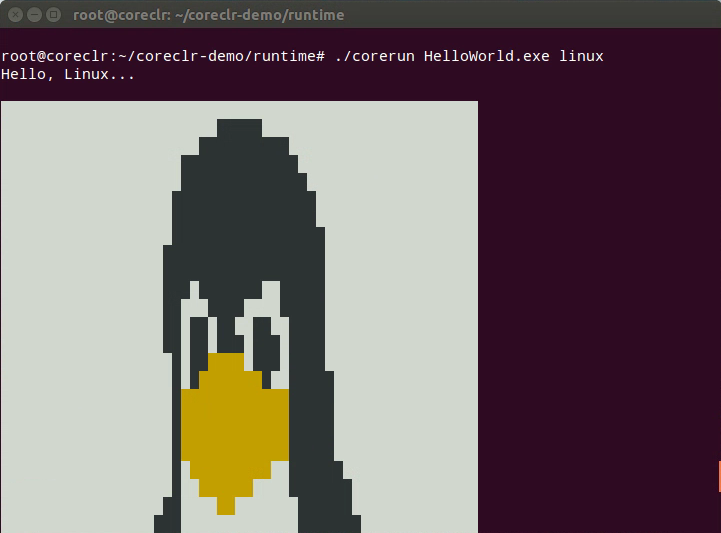 Today Microsoft announced a preview of coreclr running on Ubuntu, and this evening I was able to build it on Ubuntu 14.04 running in a docker container. There were quite a few steps involved, and as this is a preview there is also quite a bit still missing. Notably compilation of managed code on linux (using roslyn) is not available, so after building the coreclr on Ubuntu you have to pop into Windows and build it, and the corefx libraries, then copy a bunch of crap over to your linux system. You also still need mono for some callable wrappers, and nuget to grab a bunch of dependent packages. Still, all in all it feels fairly historic, and coming on the heels of Microsoft’s announcement of their new cross-platform code editor I’d say it’s been a good week for them and those of us who are fans of their tools (whatever platform we find ourselves working on). If you want to try it yourself the ubuntu:14.04 docker image is a good starting point. Note that you’ll want to install both wget and curl before following the instructions to get coreclr running. This was an odd one. On our current web data aggregation project we had a class of sites that were causing an attribute error in our python code. After some troubleshooting it turned out that the problem was in the response to our call out to phantomjs to render a page. We were expecting to get either an error or a valid response with a valid url, and instead we were getting a blank response with the url “about:blank.” Ok, knowing this made it easy to avoid the attribute error, but it didn’t get the data back. The real question was why were were getting about:blank. Various posts on Stackoverflow and other places discuss this error in the context of the –ignore-ssl-errors phantomjs command line option. Apparently if you don’t tell phantom to ignore ssl errors, and you get some on a site, you can end up on about:blank. Fair enough, but we were already passing that option to phantom, so that wasn’t our issue. I decided to fire up Fiddler on windows and tell phantom to use it as a proxy. This proved a little disconcerting, because when I did this the sites magically started working again. Clearly using Fiddler as a proxy was masking the issue somehow. I disabled the proxy to confirm that the problem returned, and it did. I then ran the process through fiddler again and checked the resulting output. As for exactly why this worked, I haven’t had time to puzzle that out yet. If anyone has some ideas post them below! My current job involves aggregating a lot of information from many websites, all of which are constructed using different tools, frameworks, approaches, etc. So, pretty much a standard web scraping challenge, except perhaps with some additional hurdles introduced by the fact that our industry hosts some of the oldest, ugliest websites you’ve ever seen. About that I will have no more to say today, but for the purposes of this post it is sufficient to note that many of these sites are… sigh… table-driven. If you’ve spent a lot of time with xpath expressions and have used tools like FirePath and tried to develop good expressions and export them to use in running applications, then you probably knew where I was going with this as soon as you saw the title. For the rest of you, maybe this will save you a few minutes somewhere down the road. According to the standard the TBODY element is optional unless a table has more than one body. Most tables have just one body, and most tables that I see in the wild omit the TBODY element from the markup. So can we forget about it? Not really. If you’re developing an xpath expression in FireFox, for example, and looking at the page DOM as you work, then you’re seeing TBODY in the tables whether it was present in the page markup, or not. Most browser rendering engines insert a TBODY around table contents. I’m not sure why, but I assume it makes the parsing or rendering path more efficient. If you’re using something like FirePath then the expression you’re developing is evaluated against the DOM, meaning that it won’t match if you don’t insert the TBODY. But what if the TBODY isn’t actually in the markup? Then that xpath expression won’t match when you move it to your application. Maybe. It won’t match if you’re running your xpath against the page markup, and the TBODY is not in the page markup. But what if you render the page in memory using something like phantomjs, a task that is more often than not required in order to access the full content displayed on the page? If you do, then what you end up scraping is the rendered DOM, serialized back into html markup. Guess what? That means the TBODY is back. The bottom line is: if you’re scraping page markup text retrieved from the site server, and the TBODY element is not used in a table, then you don’t want it in your xpath either. If you’re scraping page markup retrieved from a server-side in-memory rendering engine then you will need the TBODY, whether it was present in the markup or not. … haproxy launched at start as desired. That’s more like it. Now we can see the whole stack trace and see that the error originated on line 6 in the call to bar(). This would be helpful stuff to have in a debugging situation. So what’s going on here? print "It sure looks like it!" The interpreter creates a new traceback when the exception is initially raised on line 5. As the stack is unwound back to the first “except” block each call point (method name and line number) is recorded on the traceback. As you can see above when we first catch the exception there are four call points on the traceback. When we catch it a second time after using “raise” to re-raise it, a fifth call point has been added. The crucial thing is that “raise” did not prompt the interpreter to start a new stack trace. What happens when instead of “raise” we use “raise e” to re-raise the exception? While this is a valid pattern I’m not a huge fan of it unless information specific to the inner exception is logged or otherwise made available. There are a number of ways you could accomplish this goal, but we can leave that for another time. For now, suffice it to say that exception handling complicates reasoning about the control flow and behavior of a program, so it makes sense to keep your exception handling patterns as simple as you can.